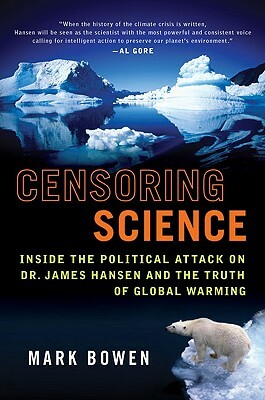 Censoring Science is the gripping story of the world's preeminent climatologist, Dr. James Hansen, the “pivotal character in the greatest and most politically charged science story of our time” (New Scientist). NASA's leading climate expert, Dr. Hansen first broke the international news on global warming at a Senate hearing in 1988. Little did he expect the rising storm of politically motivated resistance, denial, and obstruction. Revealing the extent of the Bush administration's censorship of Dr. Hansen's findings, Censoring Science sets the record straight with solid scientific facts such as: the hottest years on record have occurred in the last two decades, and ice is melting at record rates all around the planet. Dr. Hansen shows how we can still prevent environmental disaster if the country and the government are willing to face the truth about global warming. MARK BOWEN, Ph.D., is the author of Thin Ice, which was praised as “one of the best books yet published on climate change” (New York Review of Books) and named the best science book of the year by NPR’s Living on Earth; and Censoring Science, which Kirkus called "a must-read not just for environmentalists but for all politically conscientious readers." He has a Ph.D. in physics.